The tepuis or table mountains in the south of Venezuela belong to one of the earth's oldest geologic formations, the "Guyana Shield." The climate on their plateaus differs greatly from that of the surrounding areas, thus isolating the flora and fauna on them. 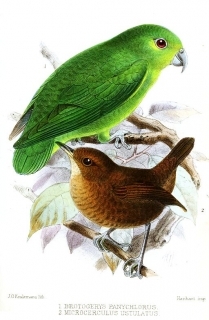 Both adults mainly green in colour; area around eye green/yellow, more so under eye; yellow wash on forehead, lores and chin, less evident in female; black bend of wing; pale yellow carpal edge. Bill dusky brown. Eye dark brown. Undescribed, but thought to be like adults. Calls made in flight are continuous, high-pitched tinkling notes, not unlike the jangling of a chain. Extremely rare; probably not kept outside of South America. Walk-in aviary 3 x 1 x 2m (9.8 x 3.3 x 6.5 ft), planted, with many perches as parrotlets are agile and good fliers. Seed mix such as: wheat, oats, canary, millet and some sunflower; millet spray, dry or sprouted; fruits such as: apple, pear, orange, banana, pomegranate, cactus fruits; vegetables such as: carrot, celery, green beans and peas in the pod; half ripened maize; berries such as: rose hips, mountain ash, Pyracantha; green leaves such as: Swiss chard, lettuce, kale, sowthistle, dandelion, chickweed; complete kibble for small hookbills if taken. Provide bird-safe, unsprayed branches such as fir, pine, willow, elder or saskatoon. Provide ladders, swings and ropes for climbing. May have declined on the Paria Peninsula due to deforestation. SE Venezuela, scattered in tepuis of E Bolivar, including forests of La Gran Sabana and nearby Kamarang River region, W Guyana; also Venezuelan populations in C and S Amazonas and north on Cerro Humo and Cerro Papelon, Sucre. May occur in N Roraima, Brazil. Found from 750-1850m (2460-6068 ft) in moist montane forest in upper tropical and subtropical zones; also found in lowland areas around the tepuis (table-like mountains found only in the Guyana highlands). Feeds on Ficus figs and the fruits of other trees. Gregarious, usually seen in flocks of 100 or more. Makes local or seasonal movements. Probably roosts and nests high on mountain slopes. Difficult to detect while resting or feeding.